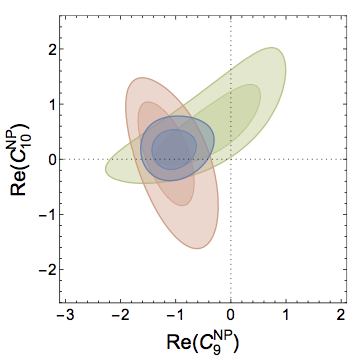 Yes, while the the blue curve fits the data better in the middle of the energy values, it's actually worse that the standard model at the low and high energy values. My questions are: does adding the term(s) that cause the curve to SM curve to upwards have any effects on other data sets? If so, does the inclusion of the non-SM term(s) become more or less statistically significant when including other data sets? Yes, the global fit to a large number of B observables improves by ~4 sigma in the presence of the O9 four-fermion operator. 5) erroneous QCD background subtraction? 7) none of the above? As with any anomaly, the mundane explanations are always the most likely ones by far. So 5) or 6). If it's indeed new physics, then a new force is the most elegant explanation. So 2). "They appear to have used a two-tailed test since 3.7σ would correspond to 0.01% using a one-tailed test". Well, the comment correctly says that if you integrate one tail of the Gaussian distribution form 3.7 sigma to +infinity, that corresponds to 0.01% of the total area under the curve. So 0.02% corresponds to integrating both tails, from -infinity to -3.7 sigma, and from 3.7 sigma to +infinity. Now, what test statistics LHC should be using is a bit above my head. I would think that using a two-tailed test is pretty standard, but Kyle is an expert and probably knows better. WOW! I actually got that. That Quanta article sure finishes on a sad note, with Nima's fragile heart and Jester's desperation. Do we really think that there will never be a bigger machine if nothing more is discovered at the LHC? Hasn't China been making noise about a Higgs factory in 2028? Surely that has at least some chance of happening, perhaps with international support. "Both the local and global p-values can be expressed as a corresponding number of standard deviations using the one-sided Gaussian tail convention"
FWIW, 3.7\sigma with a two-tail convention is about 3.5\sigma with a one-tail convention. This in itself is a minor mistake but it damages my faith in their rigour. I'm also worried about the "naive" result that two 2.9\sigma anomalies result in a 3.7\sigma anomaly. How were they added? This is a relatively big anomaly - many theorists might spend time on it. IMHO they should make a comprehensive evaluation that they are fully confident about before presenting it. I don't think they are following best practice. Xezlec, a 100 TeV collider will happen one day, but it's far in the future, whereas we need something to do in the next 25 years. Higgs factory will be essential for precision measurements of the Higgs couplings, but it will not help exploring the high energy frontier. That's why there's this feeling that we badly need a discovery NOW. The Higgs discovery is a one-sided thing - it is either there (increasing the number of events) or not, there is nothing that could produce a "negative peak". 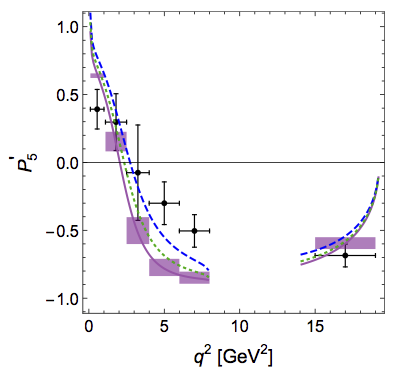 The LHCb measurements are different, deviations in both directions are possible. It makes sense to use two-sided tests.